The Tampa Bay Rays' 2008 season, the 11th season in franchise history, marked the change of the team's name from the "Tampa Bay Devil Rays" to the "Tampa Bay Rays", as revealed on November 8, 2007. The change in name also came with a change in logo and uniforms, with new team colors of Columbia blue, Navy blue and gold. The new logo, colors and name were leaked on September 20, 2007, and were confirmed officially on November 8, 2007, when an official announcement was made in downtown St. Petersburg. Prior to the decision to rename the team the Rays, other options considered included the "Aces", "Bandits", "Cannons", "Dukes", "Stripes", and Stuart Sternberg's personal favorite, the "Nine." This was the third season with Joe Maddon managing the club. The club had built upon the improvements made in 2007, and had secured the franchise's first winning record, playoff berth, and American League pennant. The Rays played another series at Champion Stadium at Disney's Wide World of Sports Complex in 2008, making it the second year that a series had been moved to the Greater Orlando area. The April 22–24 series against the Toronto Blue Jays was selected for the move. Neither the MLB — nor the Blue Jays, who were 10–17 at Tropicana Field over the previous three seasons — resisted the idea. The series move was successfully voted on by the City of St. Petersburg, who holds the lease to Tropicana Field, on January 24, 2008. This was similar to the 2007 series against the Texas Rangers, in which the Rays also won all three games. The Rays, with their off-season acquisitions and continued prospect development, fostered high hopes both within the organization and from analysts that the team would perform well during the 2008 season. Their performance on the field during spring training justified those hopes. On March 23, they won their team-record 15th spring training game, and finished with a record of 18–8 with two ties and two cancellations due to rain, along with having the highest winning percentage of all teams in spring training. In 26 games during the month, the Rays went 14–12, which marked the first time in franchise history that the team had a winning record for the month of April. After their sweep of the Red Sox, the Rays were 14–11, which was the latest the team had ever been 3 games over .500 in a season. 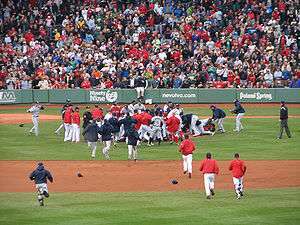 On June 5 the Rays were involved in a benches clearing brawl at Fenway Park with the Boston Red Sox following a series of events leading up from the previous night's game. In the previous game, Red Sox Center Fielder Coco Crisp attempted to steal 2nd Base, and slid into the base head first. Rays Shortstop Jason Bartlett who was covering the base on the play, knelt on his left knee while attempting to catch the throw from Catcher Dioner Navarro, which blocked the base and caused Crisp to make contact with Bartlett's leg, jamming Crisp's thumb. Crisp was safe on the play. Crisp stated that Bartlett's actions were "not something you do. You can do that, but that's shady. And he's not a bad dude, but that was shady. If you going to hurt me, I'm gonna come back and hurt you." In the same game, Crisp reached base in his next at-bat, and attempted to steal 2nd Base once again. On this steal attempt however, Rays 2nd Baseman Akinori Iwamura was covering the bag. Unlike his previous steal attempt, Crisp slid feet first, resembling the way a runner would attempt to break up a double play by sliding into the player covering the base. Crisp was out on the play. Rays manager Joe Maddon engaged in a heated argument with Crisp upon Maddon making a mound visit, Crisp being in the Red Sox dugout at that time. Joe Maddon said after the game's conclusion, "I was not pleased with the slide. I totally felt there was intent to hurt our middle infielder and that's what I was upset with. There's no place for that when you intentionally try to hurt somebody." Following the brawl, suspensions were given to players on both teams. For the Rays, Shields was given a suspension of 6 games, and for their actions in the fight, Gomes and pitcher Edwin Jackson were given 5 game suspensions, Left Fielder Carl Crawford was given a 4-game suspension, and Iwamura was given a 3-game suspension. For the Red Sox, Crisp was suspended for 7 games, and for their actions in the fight, pitcher Jon Lester was given a 5-game suspension, and 1st Baseman Sean Casey was given a 3-game suspension. Both Crisp and Iwamura appealed their suspensions. On June 27, it was announced that Iwamura's suspension was upheld, while Crisp's was reduced to 5 games, no longer making him the longest suspended player of all involved. Iwamura was unhappy that his suspension was upheld so that he would miss the first game of the next series against the Red Sox. Rays manager Joe Maddon stated that the decision "baffles" him and that he would seek an explanation from the appropriate decision-makers. Both suspensions started the following day, and the decision caused Crisp to miss the next series against the Rays at Tropicana Field. Troy Percival was placed on the Disabled List once again on July 1, due to re-injuring his hamstring, this time after running to back up a throw to 3rd base. Percival and Rays manager Joe Maddon had a brief argument over Maddon's decision to take Percival out of the game, but Percival eventually walked off the field and understood Maddon's concern. 3rd Baseman Evan Longoria was named to the American League All-Star roster on July 10. This meant that it would be the first time the Rays would ever send three players to the All-Star Game. Longoria was voted into the roster by the All-Star Final Vote, where fans vote for one of five players for each league to be the final players selected for the All-Star Game. The chance to vote began on July 6 after the initial All-Star lineups were announced. Longoria was reported to have received over 9 million votes out of 47.8 million total votes cast. He won over Jermaine Dye, Jason Giambi, Brian Roberts, and José Guillén. Barely managing a winning record for the month of July at 13–12, the Rays would nonetheless go into August with the AL East division lead having an overall record of 63–44. Despite many rumors and reports that the Rays would make a deal before the July 31 Trade deadline, the Rays made no trades. Andrew Friedman, Executive Vice President of Baseball Operations for the Rays, would comment on the lack of trade activity saying, "At the end of the day we didn't find something that lined up for us. We're in first place on July 31 and we control our own destiny. I feel we have the talent on hand to continue to do what we did the first two-thirds of the season." The injury bug would bite the Rays a few times in August. On August 3, Shortstop Jason Bartlett was hit by a pitch on his right index finger, the result of a failed bunt attempt. Bartlett was not placed on the Disabled List but missed several days before returning to the lineup as the designated hitter. He would not return to his position in the field until August 15. Left Fielder Carl Crawford was placed on the Disabled List on August 10, with a hand injury. Crawford's injury was called by the Rays as a "tendon subluxation" in the middle finger of his right hand, simply meaning that the tendon is not in its normal position. Crawford would opt to have surgery, deciding not to place a splint on his hand instead. An initial report stated that there was a possibility that Crawford would miss the rest of the season, but after it was announced that he would undergo surgery, he was reported to "likely, though not absolutely" miss the rest of the regular season. One day after placing Crawford on the Disabled List, the Rays would place Third Baseman Evan Longoria on it as well, retroactive to August 8. The injury to Longoria's right hand, suffered from being hit by a pitch, was at first thought to be just a bruise, but turned out to be a fracture. Executive Vice President, Andrew Friedman, stated that Longoria was expected to be out for three weeks. Closer Troy Percival was removed from another game on August 14, because of a right knee sprain which he suffered from fielding a bunt and tagging the runner out. After further evaluation, it was reported that there was "cartilage involvement" in Percival's injury, but it was not a tear. The following day, Percival was once again placed on the Disabled List. When the announcement was made that he would not have surgery, Percival revealed that he may return sooner than expected. Troy Percival was activated from the disabled list on September 2. In Toronto for his second outing since his return, he allowed a walk-off grand slam with two outs when the Rays were ahead by a single run and in position to win the game in extra innings. Against Boston during another extra inning game, Percival came in to close with a three-run lead and allowed the first three batters to reach base. He was removed from the game in favor of Jason Hammel, who had never recorded a save at the MLB level, and was the only remaining reliever available for the Rays in the game due to its length. Hammel converted the save opportunity, but many questioned if Percival should remain as the team's closer. The reason for Percival's removal from the game against Boston was a stiff back, and not for the game's situation, or for any sort of leg injury that had plagued him throughout the year. Percival stated that because of warming up multiple times throughout the game, only to not come in until the Rays took a lead, was what pained his back. Percival acknowledged that he knew he didn't feel well, and that he should have called for his own removal, but decided that with the lead the Rays had, he would be able to get the job done. As a result of the game, the Rays decided to not use Percival too often on consecutive nights, and using him in a tie game if the situation of the game changes while he is warming up. He would still be listed as the team's closer. Instant Replay made its debut in Major League Baseball at Tropicana Field on September 3 after Alex Rodriguez of the New York Yankees hit a ball near the left-field foul pole that was initially ruled a home run by third base umpire Brian Runge. Rays manager Joe Maddon argued that the ball was foul and asked for a review. After a conversation among the umpires, though all agreed the play was ruled correctly, crew chief Charlie Reliford allowed the replay to take place and after review, upheld the home run call. On September 19 at Tropicana Field, instant replay would overturn a call on the field for the first time ever in Major League Baseball. A fly ball hit by Rays' first baseman Carlos Peña, the umpires ruled, was interfered with by a fan sitting in the front row of the stands, when the ball hit the hands of the fan and fell back onto the field of play. After Joe Maddon requested the umpires hold a conference to discuss the play, the umpires, headed by Gerry Davis, decided to look at instant replay. Just over four minutes later, Davis returned to the field and signaled that the ball was a home run. David Price, the Rays' first overall pick in the 2007 Major League Baseball Draft, was called up from Triple-A class Durham on September 12. Price made his way up through the ranks, accumulating a 12–1 record, and a 2.30 ERA in 19 starts. He would make his first career start against the Baltimore Orioles on September 22, pitching 5⅓ innings, allowing four hits and two runs (one earned), while striking out three, but did not pick up a decision in the Rays 4–2 win that night. On September 18, it was reported that left fielder Carl Crawford would miss the rest of the regular season due to a finger injury suffered in the previous month. Joe Maddon stated that the concern was over Crawford's inability to swing a bat, and that if he were to be used at all before being completely healed, it would be for defense and baserunning. Crawford said that if the Rays were to make the ALCS or the World Series, he would have a chance to come back. For more details on this topic, see 2008 American League Division Series. In Game 1, Rays first baseman Carlos Peña started the game, but left after his first at-bat after reportedly having blurry vision because of an eye injury suffered at his home the previous night. Rays third baseman Evan Longoria hit a solo home run in the 2nd inning on the first pitch of his first career post-season at-bat, giving the Rays the early one-run lead. White Sox left fielder DeWayne Wise hit a 3-run home run in the next inning to put Chicago ahead 3–1. The Rays came back in the bottom half of the 3rd inning with three runs of their own, including another home run by Longoria, putting the Rays back on top 4–3. Two more RBI singles in the 5th inning gave the Rays a 6–3 cushion. In the 7th inning, Rays relief pitcher Grant Balfour appeared to get into an argument with White Sox shortstop Orlando Cabrera. After Balfour's first pitch to Cabrera, which was a ball to Cabrera's far side, Cabrera kicked some dirt in Balfour's direction. Balfour, who is known to get fired up by shouting to himself, may have yelled something that Cabrera took offense too. After words were exchanged between the two, play continued and Balfour finished the at-bat by striking out Cabrera. Cabrera later stated that he was unaware of Balfour's tendency to pump himself up, and that "it was just heat of the moment." Dan Wheeler would come in close for the Rays in the 9th inning. After giving up a leadoff home run, he retired the next three batters, capping off a 6–4 win for the Rays in their first playoff game in franchise history, giving them a one-game lead in the 5-game series. Peña was expected to start Game 2, but was scratched before the first pitch. Still, the Rays continued to shine. After starter Scott Kazmir allowed the bases to become loaded in the 1st inning, and gave up two runs to put the Rays in an early hole, the pitching staff would not allow another run as the Rays' offense came through strong for the second consecutive night. In the 2nd inning, Dioner Navarro cut the deficit to 2–1 on an RBI single. Akinori Iwamura hit a 2-run home run in the 5th inning to put the Rays ahead 3–2. Adding some insurance runs in the 8th inning from three RBI singles by Carl Crawford, Rocco Baldelli, and Navarro, the Rays had a comfortable 6–2 lead going into the final inning. Chad Bradford came in to finish the game off, and did so by striking out Jim Thome of the White Sox to give the Rays a commanding two games to none lead in the best-of-five series, with a chance to win their first ever playoff series, and a trip to the ALCS in Game 3 as the series moved to Chicago. The Rays looked to be in shape to win the series early in Game 3, after Akinori Iwamura hit an infield single to bring in the game's first run, but starter Matt Garza allowed the White Sox to tie the game in the 3rd inning, and then take a 4–1 lead in the 4th inning. Juan Uribe of the White Sox added an RBI single in the 6th inning to increase the lead for Chicago. B.J. Upton hit a 2-run home run for the Rays in the 7th inning to make the game a bit closer, but the Rays could not get their bats going enough. The White Sox would take Game 3 by a final score of 5–3, living to play another day only down two games to one in the series. For more details on this topic, see 2008 American League Championship Series. The Rays' next round opponent would be their division rivals, the Boston Red Sox. Boston won the American League wild card, and advanced to the ALCS by defeating the team who had finished the regular season with the best record in baseball, the Los Angeles Angels of Anaheim, three games to one in their ALDS series. The Rays won the season series against the Red Sox 10–8. In those 18 games, the visiting team won only three times. In Game 1 neither team scored until the 5th inning when Jed Lowrie of the Red Sox hit a sacrifice fly that scored a run from 3rd base. Red Sox starter Daisuke Matsuzaka held a no-hitter through six innings until a hit by Carl Crawford ended that bid with a leadoff hit in the 7th inning. Following Crawford's base hit, Cliff Floyd would single, advancing Crawford to a scoring position. The Rays however, could not capitalize as the next three batters were retired to end the inning. In the 8th inning, Kevin Youkilis hit a fly ball to left field for the Red Sox, which went off the end of Carl Crawford's glove, scoring Dustin Pedroia from 1st base and giving the Red Sox a 2–0 lead. The 8th inning for the Rays saw the first two batter reach base to send Carlos Peña to the plate with none out. With three balls and no strikes, Rays manager Joe Maddon gave Pena the green light to swing away, a move which would backfire as Peña flew out to Right Field. Evan Longoria then grounded into an inning ending double play. The Red Sox would hold on to their lead and shut out the Rays by a score of 2–0, taking the first game of the series. While the first game of the series was a pitchers' duel, Game 2 was the exact opposite. The scoring opened up quickly, as the Red Sox put on a 2-out rally against Rays starter Scott Kazmir in the 1st inning from a Jason Bay double that scored Kevin Youkilis and David Ortiz to put the Red Sox up 2–0. The Rays answered in their half of the 1st inning off Red Sox starter Josh Beckett, with a 2-out home run by Evan Longoria which also brought in Carlos Peña, evening the game at 2–2. Dustin Pedroia hit a solo home run to Left Field in the 3rd inning, which was again answered by the Rays with B.J. Upton hitting a solo home run of his own to Left Field to tie the game back up at 3–3. Carl Crawford would hit a single to score Evan Longoria, and the Rays took their first lead of the night at 4–3. Cliff Floyd went deep to Center Field in the 4th inning to give the Rays a 5–3 lead. The Red Sox would hit three solo home runs in the 5th inning, including Dustin Pedroia for his second long ball of the night, Kevin Youkilis, and Jason Bay, respectively, putting the Red Sox back on top at 6–5. The Rays would also score three separate times in the 5th inning, off of a single from Carlos Peña, a double by Evan Longoria, and a single by Carl Crawford, retaking the lead at 8–6. The Red Sox would not go away quietly as Jason Bay hit a bases-loaded single to Center Field and cut the Rays' lead to 8–7. With Dan Wheeler in to pitch for the Rays in the 8th, a wild pitch would score Dustin Pedroia from 3rd base to again tie the game at 8–8. The game would need extra innings, where in the 11th inning, and Dan Wheeler still pitching for the Rays, walked a batter with one out, and rookie David Price came in for the Rays. Price would walk the first batter he faced but stuck out Mark Kotsay, and was able to get Coco Crisp to ground into a force out at 2nd base. For the Rays in the 11th inning, Dioner Navarro walked to lead off, and Fernando Perez came in to pinch run. Ben Zobrist then walked, and a ground out by Jason Bartlett advanced the runners. The Red Sox would intentionally walk Akinori Iwamura to set up a double play chance, but B.J. Upton would hit a fly ball to Right Field deep enough to score Fernando Perez from 3rd base on a sacrifice fly, ending the game in the Rays' favor 9–8, knotting the series at one game each as the series shifted to Fenway Park for the next three games. The time that the game took to complete was 5 hours and 27 minutes. Game 3 would play out very well for the Rays. Red Sox starter Jon Lester threw four pitches in the 1st inning, but gave up one run in the 2nd inning to put his team in an early hole. In the 3rd inning, the Rays distanced themselves from their opponents. B.J. Upton hit a 3-run home run, and two batters later, Evan Longoria added a solo home run to put the Rays up 5–0 in Boston. Rays starter Matt Garza held the Red Sox scoreless until a sacrifice fly scored a run in the 7th inning, the Rays still having a 5–1 advantage. Rocco Baldelli and Carlos Peña would put the final nails in the Red Sox' coffin as far as Game 3 was concerned, Baldelli with a 3-run home run, and Peña with a solo shot in the 8th and 9th innings, respectively. The Rays would go on to win 9–1, taking a two games to one lead in the series. It was more of the same for Tampa Bay in Game 4, jumping out to a 3–0 lead in the 1st inning on Red Sox starter Tim Wakefield with a 2-run home run by Carlos Peña, immediately followed by a solo home run by Evan Longoria. Willy Aybar added a 2-run home run of his own in the 3rd inning to make it 5–0. Kevin Cash put the Red Sox on the board in the bottom half of the 3rd inning with a solo home run. The Rays however, were not finished with their offensive explosion, putting together a lead of 11–1 through six innings. The Red Sox would score a run in the 8th inning, causing Rays manager Joe Maddon to pull starter Andy Sonnanstine. Both teams would score two runs in the 8th inning, but the Rays' lead proved to be insurmountable for the Red Sox, as the Rays would take the game by a final score of 13–4. Game 5, for the longest time, looked as if it would be the series clinching win for the Rays. B.J. Upton hit a 2-run home run in the 1st inning to make it 2–0. Carlos Peña would hit one of his own in the 3rd inning, immediately followed by a home run by Evan Longoria, giving the Rays a 5–0 lead. Upton would double in the 7th inning, scoring two more runs, increasing the lead to 7–0. In the bottom half of the 7th inning, with Rays starter Scott Kazmir having been removed from the game by manager Joe Maddon, the Red Sox would begin to rally. Boston would score four runs in that inning by virtue of a Dustin Pedroia RBI single, and a 3-run home run by David Ortiz which cut the Rays' lead to 7–4. With the Rays' bats quiet in the 8th inning, J. D. Drew hit a 2-run home run to bring the Red Sox within one run, and Coco Crisp would single home the tying run to make the score even at 7–7. In the 9th inning, with the score still tied and two out, Kevin Youkilis hit a ground ball to Rays third baseman Evan Longoria who made an errant throw which allowed Youkilis to advance to 2nd Base. After an intentional walk issued by the Rays, J. D. Drew came up big for Boston once again, sailing a fly ball over the head of Right Fielder Gabe Gross which fell to the ground and then bounced over the Right Field wall, scoring Youkilis on the ground rule double and capping off the largest comeback by a team facing elimination in postseason history. The Rays series lead was now down to only one game heading into Game 6, but would now return home as the series shifted back to Tropicana Field. Game 6 began well for the Rays, with B.J. Upton continuing his postseason emergence with a solo home run in the 1st inning and giving the Rays the first lead of the night. The Red Sox returned that with a solo home run by Kevin Youkilis, leveling the score at 1–1. Youkilis would give the Red Sox the lead in the 3rd inning by grounding out, but scoring Dustin Pedroia from 3rd Base. In the 5th inning, Jason Bartlett would hit his second home run of the entire season, another solo shot which tied the game at 2–2. Again, Boston would quickly answer back, with a solo home run by captain Jason Varitek, his first base hit of the ALCS, Boston now having a 3–2 lead. Later in the inning, Coco Crisp singled, and in the next at-bat, Jason Bartlett committed a throwing error to First Base, allowing Crisp to advance to 3rd Base. David Ortiz would then hit a single to give the Red Sox a 4–2 cushion, having scored Crisp. The Rays were unable to make a comeback, and lost the game by that score, their series lead now erased as a Game 7 would now have to be played to decide the series. The starting pitchers of Game 7 were Jon Lester of the Red Sox, and Matt Garza of the Rays, a rematch of Game 3. Lester, who was the losing pitcher in Game 3, had never lost consecutive outings in his career. Dustin Pedroia wasted no time, homering off of Garza in the 1st inning for the early 1–0 lead in favor of Boston. After that, Garza was almost unhittable until his departure. Lester was also great early, retiring the first nine batters he faced before allowing a single in the 4th inning. Later in the inning, Evan Longoria dropped a double into Right Field, and scored Carlos Peña all the way from 1st Base to tie the game at 1–1. Rocco Baldelli knocked a single into Left Field in the 5th inning, scoring Willy Aybar from 2nd Base and putting the Rays ahead for the first time in the game, 2–1. With one out the 6th inning for the Red Sox, with Dustin Pedroia on 1st Base and David Ortiz at the plate, Matt Garza was able to get "Big Papi" to swing and miss for the strikeout, and Dioner Navarro gunned down Pedroia at 2nd Base, who was attempting to steal on the pitch, ending that half of the inning. Willy Aybar would belt a solo home run for the Rays in the 7th inning to give them a slightly more comfortable lead at 3–1. Garza was removed with one out in the 8th inning, having allowed only two hits and striking out nine batters, and receiving a standing ovation from Rays fans at the game as he left the field. The defending world champion Red Sox would not go away though, loading the bases in that inning. Joe Maddon elected to go with rookie David Price in hopes of ending the threat. Price would do just that by striking out J. D. Drew on a check swing. Price would return to close out the game in the 9th inning, and after two strikeouts and a walk, Jed Lowrie hit a ground ball to Rays Second Baseman Akinori Iwamura, who stepped on 2nd Base to make the final out and send the Tampa Bay Rays to their first World Series in franchise history, defeating the Boston Red Sox four games to three. Garza, who had won two games in the series, was named ALCS MVP. For more details on this topic, see 2008 World Series. In Game 1, Rays starting pitcher Scott Kazmir did not get off to a good start to the Rays' first ever World Series game, giving up a 2-run home run to the Phillies' Chase Utley in the 1st inning. The Rays had a chance to get on the scoreboard in the 3rd inning with the bases loaded and one out, but would not score as B.J. Upton hit into a double play. The Phillies would add another run in the 4th inning on an RBI groundout, jumping out to a 3–0 lead. Carl Crawford the longest tenured Ray on the team's roster, would give the Rays their first run in World Series history, by hitting a solo home run off of Phillies' starter Cole Hamels in the 4th inning, cutting the deficit of 3–1. In the 5th inning, Akinori Iwamura hit an RBI double to bring the Rays within one. The Rays would not be able to put up any more offense, with the Phillies relief pitchers retiring the Rays' last six batters and winning the game 3–2, taking the first game of the series. Game 2, saw an impressive performance by the Rays' "Big Game James" Shields. In this game, it was the Rays taking a 2–0 lead in the 1st inning, on two consecutive RBI groundouts, each scoring a runner from 3rd base. In the 3rd inning, B.J. Upton singled home Dioner Navarro, with Rocco Baldelli being thrown out at home plate after the score, giving the Rays a 3–0 lead. Shields was taken out of the game in the 6th inning after getting into a jam, but he did not give up any runs to the Phillies in the game. David Price would eventually come into the game for the Rays in the 7th inning, and would allow the Phillies to get on the scoreboard from a solo home run by pinch-hitter Eric Bruntlett to make the score 4–1 with the Rays still ahead. Price would finish the game, with the Phillies making it a bit interesting by scoring a runner from 2nd base because of an error by Rays' Third Baseman Evan Longoria, who deflected the ball into shallow Left Field. Already with one out, Price would then strike out Chase Utley, and retired Ryan Howard on a groundout to end the game and give the Rays the 4–2 win. The series would now move to Philadelphia and Citizens Bank Park, tied at one game for each team. With the start of Game 3 delayed by rain for an hour and 31 minutes, the series finally resumed in Philadelphia just after 10 pm EST. Jamie Moyer became the oldest pitcher to start a World Series game, facing off against ALCS MVP Matt Garza. Philadelphia was on the board early, as Chase Utley was put out on a ground ball that scored a runner from third. The Rays would even the game at one run each in the 2nd inning as Gabe Gross flew out on a sacrifice fly. The Phillies would take the lead back in the 2nd inning after a solo home run by Carlos Ruiz. The Phillies would make it 4–1 in the 6th inning from back-to-back home runs by Chase Utley and Ryan Howard. Gabe Gross scored Carl Crawford by grounding out, and Jason Bartlett would do the same to score Dioner Navarro during the next at-bat to make the score 4–3 Philadelphia. In the 8th inning for the Rays, B.J. Upton would single to reach base. During Evan Longoria's at-bat, Upton would steal 2nd base, and later steal 3rd base in the same at-bat. Trying to throw out Upton at 3rd base, Phillies catcher Carlos Ruiz made a throwing error which allowed Upton to score and tie the game at 4–4. The 9th inning went sour for the Rays defensively, as Phillies batter Eric Bruntlett was hit by a pitch. When Bruntlett attempted to steal 2nd base, Rays catcher Dioner Navarro made a throwing error which allowed Bruntlett to advance to 3rd base. The Rays intentionally walked the next two batters, which loaded the bases with no outs. Carlos Ruiz would hit a soft ground ball down the 3rd base line, which was fielded cleanly by Rays 3rd baseman Evan Longoria, but trying to toss to Navarro at home to make a forceout, sailed the throw over the catcher's head, and the winning run was scored by the Phillies to win the game 5–4, and take a two games to one series lead. Because of the game's late start, it was not completed until 1:47 am EST. At one point, it began to rain, and the weather conditions would get worse as the game continued. There was much speculation, including that from Fox baseball commentators Joe Buck and Tim McCarver, that the game may be called early because of the weather. Major League Baseball rules state that the game could have been called after the 5th inning, ending the game and resulting in the Phillies winning the World Series. MLB commissioner Bud Selig had made it clear to both teams prior to the game anyway, that the game would not be called early under any circumstance, as he would not allow such an important game like this to be ended before the 9th inning. However, such a controversy was prevented from happening because of the events on the field, when in the 6th inning, Carlos Peña scored B.J. Upton to tie the game at 2–2. Following the completion of the top of the 6th inning, the tarps were pulled over the infield, and the game was delayed until 11:10 pm EST, when it was officially announced that the game would be suspended, making it the first time a World Series game had ever been suspended. It would not resume the next day, as it continued to rain in Philadelphia, but the day following that, the game would resume. The Phillies had scored in the 1st inning in each game of the World Series in Philadelphia, and essentially did the same again as Jayson Werth singled on a pop up that scored a run in the bottom of the 6th inning to give the Phillies a 3–2 lead. Rocco Baldelli kept the Rays in it with a solo home run in the 7th inning to tie the game again. Pedro Feliz would answer that home run with an RBI single that ended up being the game winner, as Phillies closer Brad Lidge would strike out Eric Hinske in the 9th inning to end the game. The Philadelphia Phillies had defeated the Rays four games to one to win their second World Series title, and first since 1980, and the first championship for the city of Philadelphia since the 76ers swept the 1983 NBA Finals. Cole Hamels was named MVP of the series. In March 2008, the Rays announced Tropicana Field would host seven Saturday night postgame concerts featuring various artists. One concert would be added to the schedule later in the season. Interestingly, the Rays did not lose any of the eight games in which a concert followed. AA Montgomery Biscuits Southern League Billy Gardner, Jr.
↑ "Rays Index". Raysindex.blogspot.com. September 20, 2007. Retrieved November 29, 2008. ↑ Keri, Jonah (March 2011). "Chapter 7: The Exorcism". The Extra 2%: How Wall Street Strategies Took a Major League Baseball Team from Worst to First. ESPN. ISBN 0-345-51765-2. ↑ "Rays: MLB, likely foe open to return to Orlando". Sptimes.com. Retrieved November 29, 2008. ↑ Bill Chastain. "The Official Site of The Tampa Bay Rays: News: Rays look to re-up series at Disney". Tampabay.rays.mlb.com. Retrieved November 29, 2008. ↑ "Hank: Yanks need to be more like Rays". Blogs.tampabay.com. May 14, 2008. Archived from the original on June 17, 2008. Retrieved November 29, 2008. ↑ "Kazmir Leads Rays Over Rangers 7–3". .tbo.com. May 26, 2008. Retrieved November 29, 2008. ↑ Cherry, Gene; Sonia Oxley (September 27, 2008). "Rays claim AL East title to cap turnaround". Reuters. Archived from the original on September 30, 2008. Retrieved September 28, 2008. 1 2 Chuck, Bill. 100 random things about the Red Sox, Rays, and Yankees, The Boston Globe. Published April 2, 2009. Retrieved May 2, 2009.